26" L x 18" W x 1-1/8" Hgt. Light Green Fiberglass Display Tray | U.S. Plastic Corp. 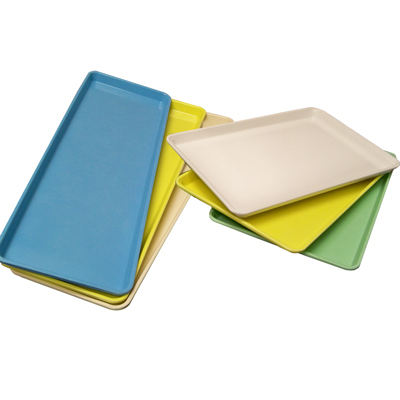 Display trays have been used by supermarkets, bakeries and delis for years. These pans are ideal for showing all your baked goods, meat, fish, poultry, deli items and confections. Present your best on these attractive, easy-to-clean and stain resistant pans that come in a wide range of colors to make your product look its best. Pans are made to withstand temperature from -40°F to 300°F and are perfect for display, delivery, storage or refrigeration. Prevent cross contamination with HACCP color coded trays. Meets FDA regulations. Dishwasher safe. Smooth surface will not harbor bacteria, odor and stains. NSF.